The Transition Year Programme will take place from Monday 4th to Friday, 8th of March, 2019. Thank you for your interest in our programme. Please be informed that we are fully booked now and waiting list is closed. For all students attending, please note that an information package will be sent to you via email on 15th February, 2019. For more information please contact Maria Copley at copleym@tcd.ie or dial 01 8962336. 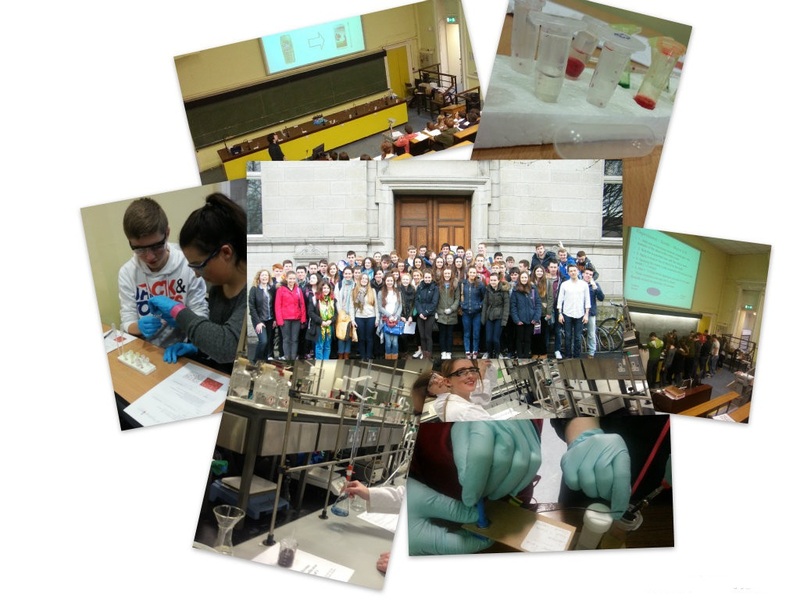 The School of Chemistry hosted its annual Transition Year Programme from Monday 26th February to Friday 2nd March, 2018. Now in its ninth year, the 60 places were highly sought after. The week kicked- off with a safety lecture and a general introduction to the three main disciplines within Chemistry (Inorganic, Organic and Physical). In an action-packed next 2 days, the students carried out experiments in our state-of-the-art undergraduate teaching labs. The experiments ranged from synthetic preparations to an analytical chemistry competition but all involved team work and the application of new practical skills. Tours of the College’s facilities, on the third day, showcased the modern TCD sports centre, and the world-class research laboratories and facilities in Trinity Biomedical Sciences Institute (TBSI) and CRANN. The students got a real insight and a tangible taste of what being a student in Trinity is like. 'The tours of Trinity furthered my interest in attending this university'. Towards the end of the week the students were treated to a number of postgraduate presentations which depicted 'A Day in My Life as a Chemistry Researcher'. These provided a sense of how research is conducted and how it contributes solutions to global challenges e.g. in energy, health and the environment. Directly after the presentations the TY students got to experience hands-on experiments which were linked to the postgraduates research and included making fluorescence slime, looking at responsive glass-technology and trying out the Kastle-Meyer test for haemoglobin. Finally the week was wrapped up by an excellent group-presentation feedback session, a group photo, a trip to the Book of Kells and an exciting SF Chemistry Broad Curriculum finale. TY Group photo. Surrounding photos: TY students working in the lab and doing hands-on experiments. …………….and from parents and teachers.